In the 90s, the English town of Stourbridge became known for spawning three of the countries finest bands - the Poppies aka Pop will Eat Itself, Neddies aka Ned’s Atomic Dustbin and of course, the Stuffies aka The Wonder Stuff. The Stuffies last played in Australia with Jesus Jones in 2011. They are returning for a headline tour in Feb/March 2014 performing their classic album Never Loved Elvis in it’s entirety! Released in 1991, Never Loved Elvis was the Stuffies third album and was considered a great leap forward. It was at this point that the band had found their groove and turned out a sound that showed evolution and progress with a little bit of everything thrown into the musical mixing pot with stylings such as Celtic shadings, country raucousness and good-time heel kicking rock driven by fiddle, banjo and piano among other elements. The sessions spawned the pure pop gem Size Of A Cow, which Miles Hunt confessed “I haven’t got the slightest notion what it’s about”, the music-hall chant-along Welcome To The Cheap Seats, the Aust Top 40 hit Caught In My Shadow, Mission Drive and Sleep Alone. 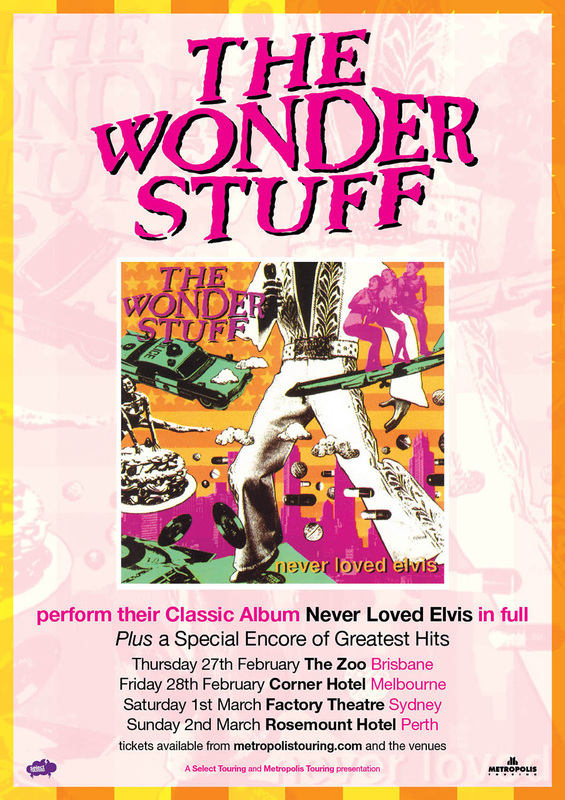 Alongside Never Loved Elvis being played in it’s entirety, there will be an special encore featuring a plethora of other Stuffies classics including Give Give Give Me More More More, Don’t Let Me Down Gently, It’s Yer Money I’m After Baby and Unbearable just to name a few.